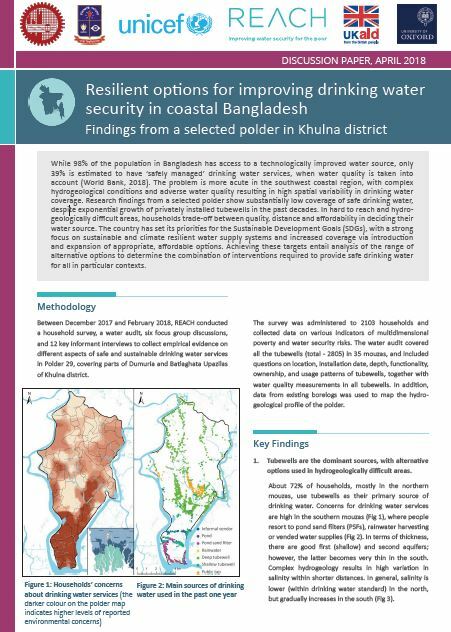 While 98% of the population in Bangladesh has access to a technologically improved water source, only 39% is estimated to have ‘safely managed’ drinking water services, when water quality is taken into account (World Bank, 2018). The problem is more acute in the southwest coastal region, with complex hydrogeological conditions and adverse water quality resulting in high spatial variability in drinking water coverage. Research findings from a selected polder show substantially low coverage of safe drinking water, despite exponential growth of privately installed tubewells in the past decades. In hard to reach and hydrogeologically difficult areas, households trade-off between quality, distance and affordability in deciding their water source. The country has set its priorities for the Sustainable Development Goals (SDGs), with a strong focus on sustainable and climate resilient water supply systems and increased coverage via introduction and expansion of appropriate, affordable options. Achieving these targets entail analysis of the range of alternative options to determine the combination of interventions required to provide safe drinking water for all in particular contexts.